Throughout Eastern Europe the sacrifice Soviet soldiers made to end the Nazi regime is marked by monuments and statues. In some countries, such as Estonia, they have become a source of controversy, but not in Slovakia. Slovakia has a liberal approach and the government is ready to pay tribute to the Red Army soldiers who died fighting fascism. On April 4, 1945 Slovak partisans and Soviet soldiers freed Slovakia from fascism. Every year, officials pay tribute to the thousands of Red Army soldiers that sacrificed their lives. Slim columns calling for peace contrast with a massive Soviet monument. In total, about 60,000 Soviet soldiers died liberating Slovakia from Nazi rule. Around 7,000 of them fell in the battle for Bratislava. “Today, unfortunately, you won't see opinions like this everywhere. Here, in Bratislava, people have a special attitude towards it. That is great. That is really nice. It is something our future relations are based on,” Boris Gromov, the Moscow region Governor, stresses. 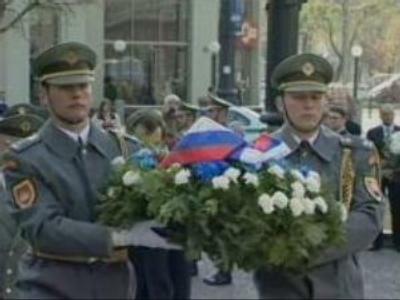 Slovak veterans also remember the Russian war heroes. “We met the Soviet soldiers at Levitce. They were exhausted because they had been fighting all the way from Leningrad to Moscow through to the frontier. We got on really well,” said Milan Koshikar, a Slovak veteran. The end of WWII marked the defeat of Nazi Germany in many Eastern European countries. Thereafter, much of Eastern Europe became part of the Soviet sphere of influence. In Slovakia, the Soviet Union had a dominating role for 41 years. But some other Eastern European countries have bitter memories of the communist times. In Estonia, for example, the monument to Soviet soldiers is set to be removed from the centre of the capital, Tallinn.